The menu was in my way of doing things. Example: I like to use Shift + Windows key + Right arrow to move the active screen to my second screen. I got mix actions and no moving my window. Right-click on the menu for X-menu not there, just full menu. I tried to understand the menu layout and tried to group like programs under common menu item, not one item work for me. Can anybody tell me where the settings wheel is setting? The power switch was somewhat hidden. the free ClassicShell is so much better but has stopped and is taken over. It´s now called Open-Shell-Menu and you can download it here https://github.com/Open-Shell/Open-Shell-Menu and is also totally free. I’ve been using this little program on my 2 PCs for 3 years now, and I like its power control functions most. It deserves strong recommendation! been using it in pro version since earlier versions on win7, makes win10 usable again. love it. Metro theme works great with win10 and aero transparency. rs6 insider previews. Just try the options to customise it, and you can drag, drop borders, etc. LOTS of options. I first checked SM-X almost 4 years ago for my W8 laptop and don’t regret doing it. It got flaws like crashing or stopping to work. For example, not responding to W-Key or showing W-screen. But helps a lot for bringing back the old S-Menu almost as it should be. Also working as a customizable extension of the Status Bar. Not to mention, the Chronometer. As just a few programs have options to turn off/sleep after the tasks. I have used this program since it was freeware years and years ago. Why? One simple reason: On a single screen I can see every program I have and launch any of them with a single click. Additionally, I can select other ways to view my system, such my program files, my control panel, my desktop, or any other program grouping I’d care to create. Its truly an all-in-one Start Menu solution, well worth my 5-star rating! I love it. So much better than the one that came with Windows. Thank you. Pretty ordinary program in comparison to the freeware Classic Shell. And look here, its normally $20? crikey; what a total ripoff. Dear Microsoft, everyone just wants the Windows XP menu back please — it was dead set simply, easy, quick, and worked. At least simply bring it back as an option. NOT version 6.3 as advertised. The executable shows it to be version 6.2.0.1 Getting to be as bad as another Giveaway site I could mention. I like all the features. The response time is fast. Not hesitating or no menu wanting to popup at all like the original. From what I remember of the other start menus this I like better. It beats the original WIndows 10 menu. Just have to find something for the rest of Windows 10 to be happy. Don’t what’s up with this commenter, it says I already said this but this is the first comment for this that I can remember. Pretty finicky, I must not be leaving a long enough comment or something so maybe I need to type a few more words. I’ve been running this on three machines for a few years now, and I really like it. I’m not a big fan of ’tiles’ and the other nonsense Microsoft introduced starting with Windows 8. It’s nicely customizable, including timer based sleep and shutdown. Smooth transition from my Windows 7 to the Windows 10 ‘upgrade’. By holding down the Shift key while clicking Start, the original Start function is still there in case you want to temporarily revert to that. On one of the machines, for some unknown reason it doesn’t start every time the machine boots, and so I’ve set it up as a task to load with a slight delay, and that has worked fine. I’d definitely recommend trying it if this is something that interests you. The Start menu is a user interface element used in Microsoft Windows since Windows 95 and in some other operating systems. It provides a central launching point for computer programs and performing other tasks. The Start menu has under gone many iterations of changes, and new features and functionalities being added to it every time. Regardless of all the features and functionalities it provides, some people simply do not like it, and want to organize and customize it the way they want to. To help with this, there are a few applications available that allow you to customize the Start menu or create an entirely new one. Start Menu X PRO is a small and lightweight application designed to help you replace your old Start menu with a new one (Windows 7 and older versions), or create and add a new one (Windows 8 and 10). With this application you can replace or add the Start menu, change the Start button, customize the looks of the menu to different skins, perform searches, and organize apps into groups of your choice. The installer size is ~6MB, and the installation process is simple and straightforward, taking no time at all to complete. The version provided here comes pre activated and registered, other versions can be activated with keys. By default, in Windows 8 & 10, it adds a new Start menu which can be opened using the Windows key, and the original Start menu can be accessed using the Shift + Windows key combination. You can then start using your customized or new star menu and take advantage of the features it comes with. The application does not have much of a UI itself, it stays hidden in the system tray, you can click on the icon to show the Start menu, and right click on it to access the menu to change language and adjust other options. In the options menu you can decide which start menu to open with the Windows key and which one to open with Shift + Windows key combination. You can change the skin, adjust scaling, create and manage virtual groups, and choose width of the Start menu. Start menu icon can be changed too, and you can choose the controls that you want to see on the Start menu. Moreover, when the Start menu is open, the application allows you to set up many shortcut keys to perform different tasks. There are three different styles to choose from, and there are advanced options too, for advanced users. 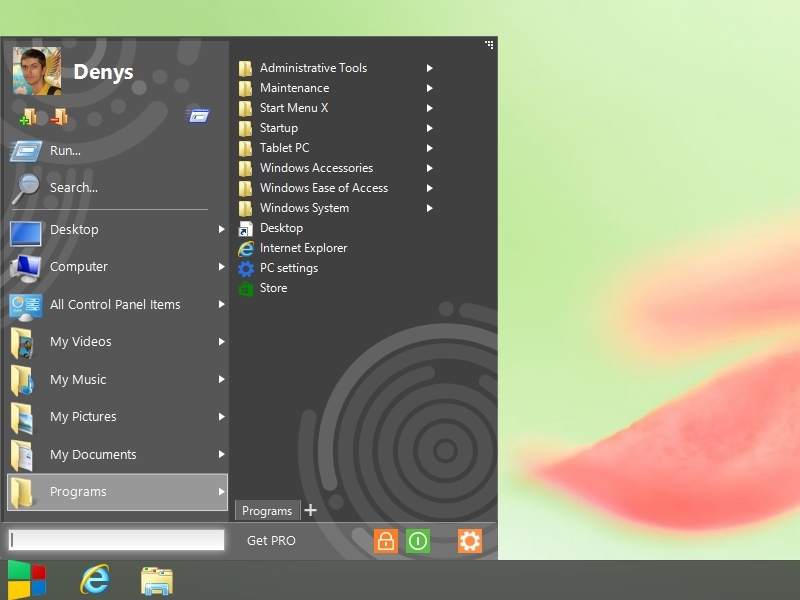 – Customize Windows Start Menu, or create a new one that is customizable. – Drag n drop, and resize the Start menu according to your preference. – Comes with all the basic functionalities of the Start menu, plus some great added features to make it a useful tool. – Trigger the Start menu using Windows key, or Shift + Windows key combination. – Skin can be changed, change the scaling, and adjust the width. – Start menu icon can be changed, and you can decide which controls to show up on the start menu. – Predefined shortcut keys, these can be changed too. – Language of the application can be changed to any of those available. – A small delay in displaying contents of a directory, when you hover your mouse pointer over it. – Themes do not look pleasing and do not blend in well with the UI of Windows 8 and 10. Start Menu X PRO is a lightweight and simple application, that comes packed with great features. The Start menu works and functions like the original one, with added functionalities. If you are not happy with Windows default start menu, then this is the application for you to try. Its ok-ish. A bit clunky to be honest. It does not look or feel like the standard Start Menu and is not as good as the free alternative called ClassicShell (http://classicshell.net/). 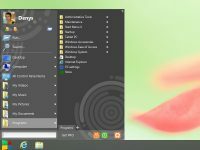 Unfortunately, the ClassicShell developer has just announced he’s stopping developing it (though he’s made it opensource) so StartX may be an alternative. I struggled to like StartX.